You may be someone who likes to apply a layer of car wax to your vehicle after it has been washed. This is a product that typically is used to make metal, plastic, and fiberglass really shine. Most people will use wax to even polish a boat. A buffer or elbow grease is often the method used to apply this product. However, a variety of other uses are available. A bottle of car wax can be used as a cleaning accessory in your home. The reason a polish or wax is an ideal product for cleaning is eliminating friction. This is the reason the surface of a car is smooth when a layer of polish or wax has been applied. All you need to do is determine where to use car wax in your home. Many things that are in your home can benefit by applying car wax. This is an ideal option to help you out when cleaning is necessary. One thing to realize about this product is it creates a buffer which can prevent dirt and dust from sticking to most surfaces. All you need to apply wax is an old rag. Elbow grease will be the best method to apply car wax to items in your home. The best way to know if this product will be beneficial is to try it and see the results. 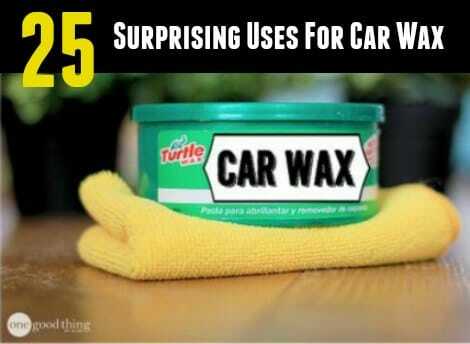 If you do not already have a wax, then a bottle or container can easily be found at a local auto supply store. There are a few cautions to note when using car wax as a cleaning product. You do not want to use this on countertops, showers, and bathtubs as the surface will be really slippery. Having food slip off of the counter in your kitchen or falling in the shower is not something that you want.